d’UVA and Bioplastics: Will it happen? Home » d’UVA and Bioplastics: Will it happen? We strive to be environmentally sustainable in all steps of d’UVA production. Our agricultural practices are organic and biodiverse; the grapes are handpicked; the water added is fresh spring water; and all ingredients infused in the juice are organic. Unfortunately, the plastic bottles feel like a red X mark on our report card of good practices. Plastic is ubiquitous, and we can’t blame our ancestors, nor ourselves, for embracing it wholeheartedly. When it arrived in the late nineteenth century – its first object being, of all things, the comb – it heralded material freedom. Before plastic, every material used by humans came from a limited supply of something natural, such as wood, glass, stone, or ivory. Today, the mere refinement of oil and natural gas to create chains of of polymer bonds will produce a plastic that’s sturdy yet lightweight, essentially odorless, and cheap. Unfortunately, the way we make it renders it difficult to biodegrade and environmentally costly (and, with over 90% of plastics not even recycled, we sure ain’t helping matters). 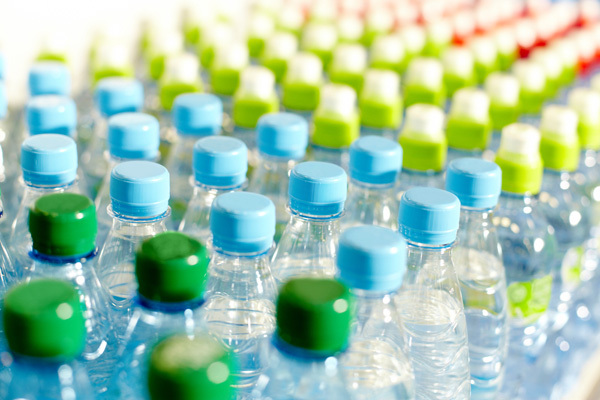 1.5 million barrels of oil are used yearly to make plastic water bottles alone (Postconsumers). Over 90% of plastic bottles aren’t recycled. But the first plastic was not actually produced from petroleum (Scientific American). It was made from a material that, if we were to use it today, would produce a bioplastic: plant cellulose. In fact, there are myriad ways of creating bioplastics; this European Bioplastics Factsheet provides information on all types. And there exist as many variables as there are ways of creating it, such as the cost, strength, look, and time to decompose. In considering bottles for d’UVA, we’ll begin by narrowing the criteria down to include just those bioplastics that are clear or highly transparent, resistant to high pressures, and water resistant. Below are some interesting possibilities that each meet at least two priorities (How Stuff Works). We’re excited thinking about d’UVA swishing around in bottles that won’t cut into the precious oil supply nor scour the ground for thousands of years. Could one of these contestants be The One? This kind of bioplastic is garnering more and more interest because of its insolubility in water, transparency, and biodegradability without leaving residues. It’s created from bacteria-processing starch or glucose; the South American sugar cane industry is especially involved in its production (Innovative Net). It might be resistant to high pressure processing (Microbial Cell Factories). With all the chickens we eat, their feathers have actually become a nuisance to dispose of. With their high level of keratin, a very strong and durable protein also found in horse’s hooves (and think how strong those are! ), chicken feathers can be processed into something useful. Scientists combined methyl acrylate with keratin, getting exciting results: a plastic made from natural, agricultural resources that is stronger than all the other types of bioplastics (read: stable under high pressure) and is also water-resistant (The Recycle Times). This gets extra points for upcycling something that is decidedly unsustainable, the thriving factory-chicken industry. Unfortunately, it doesn’t seem to be transparent. Another way to repurpose polluting byproducts is found in lignin, which comes from the processes of paper mills, to create a plastic that looks and acts like petroleum-based plastic, but biodegrades. The mix is simple: lignin and water are compressed at high temperatures and combined with wax to create this completely non-toxic product that is, not surprisingly, as recyclable as paper or wood. High pressure hydrolysis during production makes this water-proof (Wise Geek), but liquid wood is not transparent. I’m picturing wooden bottles of d’UVA, which doesn’t quite fit the image. Would mini wine barrels be okay for a non-alcoholic drink? These are the corn-based plastics that are used for packaging many different food products already (and can also be produced from wheat and sugarcane). Its most appealing aspect is that it uses 20 to 50% less fossil fuel to produce, and also degrades within less than two months. It can be transparent, and certain forms are more resistant to high temperatures without softening (up to 120°, which seems safe for liquids) (Innovative Industry and Revipackonline). PLA bioplastics are also stable under high pressures, and the most enthusiastic research seems to be in this area, offering improvements quite frequently. Many other plastics are being created, tested, and applied from various materials, all for the sake of using less petroleum and taking less time to decompose. But it’s important to realize that, as we all know, there is no such thing as a free lunch. In other words, in a perfect world that uses the most happily-composted plastic for all plastic goods everywhere, how much petroleum will be used to transport materials, get the machinery running, package the goods, etc.? And as with all things man-made, hidden costs in environmental damage or other areas will surely rear their ugly heads with bioplastics. Just as an example, the PHA type of bioplastic is heralded for being the only type that is biodegradable in waterways and soil; no more roadside trash or floating litter (if everyone who littered used bioplastics, a bit of an oxymoron). But, when PHA invariably finds itself in a landfill and moisture happens to seep in (also invariable–try to imagine a dry landfill), PHA will begin to decompose anaerobically, letting off the greenhouse gas methane. All that cost to make a “green” plastic would go to producing more greenhouse gases. The web of costs is complicated, to say the least! And furthermore, there is a difference between degrading and composting. A plastic that degrades will simply break up into tinier and tinier pieces, never changing its structure; while a plastic that is compostable will disintegrate into organic matter. Degrading plastic is clearly better than the kind that sticks around 1000 years, but should we also be aiming to create not just degradable, but more compostable plastic? The ideal solution would be to create compostable plastic that uses as little fossil fuel in every stage of production as possible. Perhaps some of the above plastics – and the many others that are being tested and created – will eventually fit the bill, without exaggerated costs.